Austin’s professional most affordable home security burglar alarm monitoring service provider. Professional security alarm, access control and video surveillance service. Advice on getting professional alarm monitoring, access control and video surveillance services. Advice on getting professional security alarm monitoring, access control and video surveillance in Austin. Don't sign a long term contract to get security alarm system or monitoring service, the industry standard is 3 years. Other alarm monitoring contracts are 5 to 7 years in length. Central Security requires only 90 day notice to cancel security alarm service. Don't agree to a Credit Check or give Social Security number to get security alarm monitoring. This is often a sign that your information and monitoring service contract are going to be sold or traded off. Make sure security monitoring central station monitoring center is a "Five Diamond Certificate" rated company. The Central Station Alarm Association post what monitoring centers operate under strict standards and at no charge issues certificates. Make sure your home security burglar alarm system technician knows what he is doing and explains how to operate security system. Know how to manually test your monitoring system for communication with central station. Test your alarm system periodically to make sure everything works. Only use wireless equipment or devices as a last resort. Check with local municipality to see if alarm permit is required. Central Security will give notice of proper permit if required upon activation. If you have a home security burglar alarm system already in your home, more than likely the alarm system will work fine and can be reprogrammed to work with any alarm system monitoring center. Hardwire alarm systems will typically last for 3 decades. Hardwire alarm systems will outlast door contacts, window contacts and most devices. Central Security is expected to be the most reasonable alarm system company for Austin and all surrounding areas. 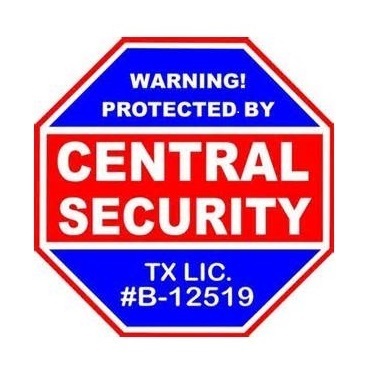 Central Security provides FULL SERVICE alarm system monitoring with alarm system equipment in Austin, Texas and the following counties: Travis, Williamson, Bell, Burnet, Bastrop, Coryell, Caldwell and Hays. Austin alarm system service without the standard 3 year contract and/or credit check. No upfront cost for alarm system standard installation and free house equipment. No charge for site visit or quote. No charge for service calls or basic replacement parts. If you need Austin an alarm system service look no further.Central Security Austin offers the best alarm system deal you’ll find. Central Security installs only premium alarm system equipment and products. Central Security has the most flexible range of alarm system services, including cellular monitoring, two-way voice monitoring, IP-module monitoring, interactive application smart phone, and much more. If you have alarm system with other provider in Austin or have current alarm system in home, working or not, Central Security can use existing alarm system equipment with services offered, and will add any additional items or devices upon request. Central Security prides itself on being the most knowledgeable alarm system company in Austin. Central Security has and will beat any competitor’s price with our lowest price guarantee on alarm system service. Central Security makes the process of getting alarm system service simple and professional. Our goal at Central Security in Austin is to get you protected with a alarm system with professional installation at a price the competition can’t touch. Central Security prides itself on making the process of getting Austin alarm system monitoring simple and most affordable. Central Security gives you a person you can call and knows exactly what is going on when it comes to protecting your home or small business. Central Security in Austin can get just about any brand of alarm system on the market. Central Security can hack or reprogram your existing alarm system to work. In the event that someone ignores our security sign & stickers and tries to access your home or business our 24X7 alarm system service will work to your advantage. The alarm system will sound once tripped and send burglar alarm signals out to our top rated alarm system monitoring central station. Central Station will attempt to contact you for notice and dispatch emergency personnel if needed. The private security industry is Licensed and Regulated by the Texas Department of Public Safety. Any alarm system company or person selling, soliciting or installing alarm system service or alarm system equipment must carry issued identification from the Texas Department of Public Safety. Laws regulating the alarm system industry originally passed by Texas Legislature in 1969. To offer or provide alarm systems and/or monitoring service requires a license, doing so without a license carries criminal penalties; Up to a year in jail and a $4,000.00 fine. Hiring or employing an unlicensed alarm system company also carries this penalty. After purchase of Austin alarm system, please make notice to local municipality for proper registration if such registration is required by municipality. If responding authority requires permit for alarm system service, notice will be given. Full Service Alarm System Monitoring in Austin. Full Service Security System & Monitoring provided by Central Security to the following: Austin, Liberty Hill, Leander, Cedar Park, Volente, Georgetown, Granger, Taylor, Thrall, Hutto, Round Rock, Pflugerville, Manor, Elgin, Webberville, West lake Hills, Bastrop, Creedmoor, Mustang Ridge, Niederwald, Kyle, Mountain City, Buda, Sunset Valley, San Leanna, Village of Bear Creek, Dripping Springs, Bee Cave, Village of the Hills, Lakeway, Briarcliff, Lago Vista, Jonestown. If you have a alarm system already in your home, more than likely the alarm system will work fine and can be programmed to work with any alarm system monitoring center. Hardwire alarm systems will typically last for 3 decades. Hardwire alarm systems will outlast door contacts, window contacts and most devices. Central Security for Austin, Alarm System and Alarm System Monitoring Service provided to all surrounding areas of Austin. Whether you want protection for your home or even a small business, the alarm system from Central Security in Austin will fulfill your alarm system monitoring needs and most importantly, fit into your budget. * Central Security Austin offers the most reasonable price in Alarm System Service, compare, call & save today. * Central Security for Austin uses the top rated UL listed alarm system equipment in the industry. * Central Security 24/7 alarm system monitoring center is certificate issued and rated best of the best by Central Station Alarm Association. * Central Security gives customers guaranteed locked in alarm system monitoring service rates. * Central Security wants to earn your business and has the most flexible alarm system equipment and alarm system monitoring packages in Austin. * Alarm system monitoring for Austin without the long term contract or credit check. * Central Security offers Full Service alarm system monitoring and does not charge for certain trouble service calls. * Central Security remits certificate of installation of security system with certificate rated monitoring service to customer for up to 20% off Homeowners Insurance. Central Security Austin offers the best alarm system monitoring deal you’ll find. Central Security installs only premium alarm system equipment and products. Central Security has the most flexible range of alarm system services, including cellular monitoring, two-way voice monitoring, IP-module monitoring, interactive application smart phone, and much more. Austin Central Security provides an extensive selection of alarm system equipment and components. Additionally, our alarm system monitoring packages are designed to fit any budget. Let Central Security in Austin help you find the right alarm system package for your needs, start protecting your home and family today. Central Security is committed to excellence and affordability when it comes to securing your home in Austin with alarm system service. Family is your top priority and home ownership is probably your largest investment; Take precaution, provide alarm system monitoring for your residence. Central Security is committed to helping customers meet alarm system needs and providing customers with top quality certificate rated alarm system service. Central Security is Austin’s alarm system provider. Central Security has a staff of locally trained professionals with the ability to reprogram and monitor almost any existing alarm system in the Austin area. Central Security specializes in working with existing alarm systems that are with other providers. Central Security will make alarm system installation quick and painless. Austin alarm system equipment and alarm monitoring solution professionals. The information you obtain at this website is not, nor is it intended to be, advice. You should always consult with Central Security on site for advice regarding your individual situation. Central Security invites you to make contact and welcomes your call, letters and electronic mail. Contacting Central Security does not create a relationship. Please do not send any confidential information to us until such time relationship has been established. Central Security Home Security Burglar Alarm System Austin Monitoring Service Pros Central Security sells alarm system equipment to customer at distribution cost. Standard installation and materials are provided to customer at no cost with service agreement. Customer pays first and last month upfront. All fees are taxed by Comptroller. ADT / Protection One / Central Security Group Customer Notice!